Early 2016 I completed couch to 5k and promptly stopped running being confident that I was not ‘built’ for running and that it was not something I could ever enjoy. Fast forward to 2017 and I decided to mark my 40th year by ‘ enduring’ the St Michaels 10k race – ie do something I have no natural ability for, in front of people that I am likely to know. Bizarrely as I made this decision a few friends pointed me at the 10 weeks SMM beginners course. So on 4th January 2017 I put on my big girl pants and crept in to club, heading straight to the back of the crowd with my head down feeling pretty sure the ‘real’ runners would be smirking at this ‘new’ girl who would obviously never be an athlete. I was quickly welcomed and given the appropriate forms to fill in. And then Bill starting speaking – no idea what he said apart from for the beginners would be running 3ish miles!!! (I text my husband at this point and got a laughing response) And we were off, I approached it very slowly, with Ann as back marker being very supportive and kind, and the various runners who mustered back multiple times all smiling and giving encouragement (they could actually run and speak – I was in awe! ), I left feeling amazed with what I had achieved. 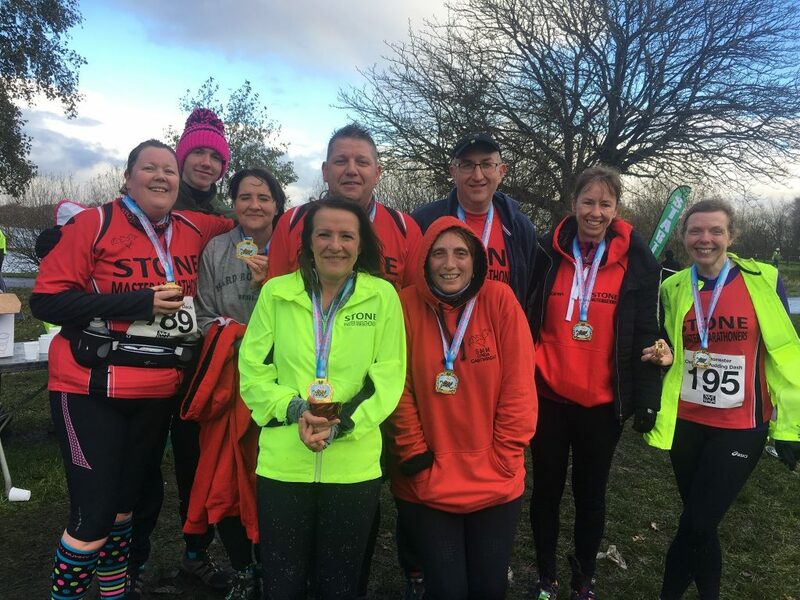 This was the start of my beginners journey – I turned up each and every Thursday, and quickly got to know most of the other runners who were all positive, encouraging and keen to share knowledge – and very slowly it got a tiny bit less painful. I also went out twice a week alone to do 5km as advised to try and improve – although I had to do this in the dark as I was terrified someone I knew would see me being very purple faced. After a few weeks I realised 3ish could be very ish, and learned that a ‘long’ run was required if I wanted to get up to 10k – so I started running alone on a Sunday morning – in the daylight! The 10 weeks had flown so I joined SMM as a member, and after various conversations before and after runs (still hadn’t mastered speaking during) I decided that my original challenge wasn’t enough – it wasn’t a challenge anymore, I had already done one race – and so I decided to make it a ‘proper’ challenge and so 10 10ks in a year it had to be, and could I manage to keep up this new hobby for a whole year? 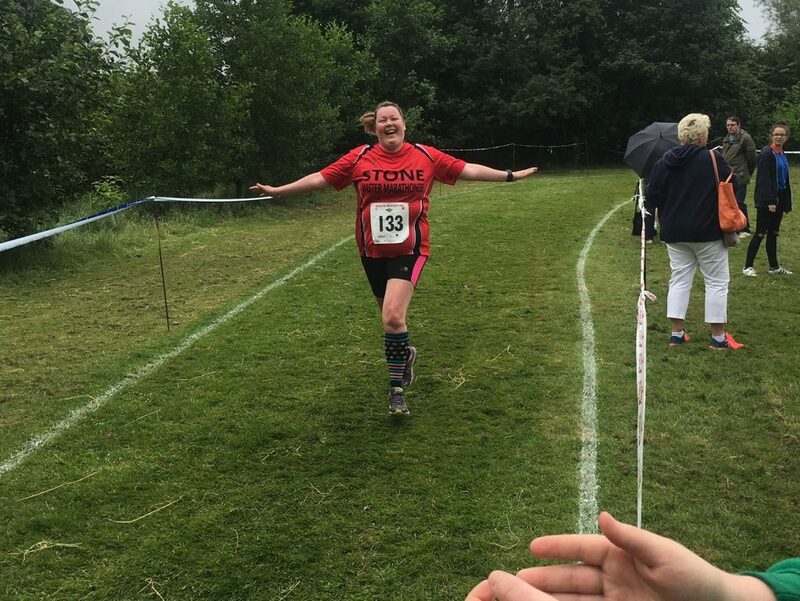 I carried on coming on a Thursday – taking advice, sharing turns in motivating each other, being cajoled by Bill, and making some really nice new mates – I even mastered running and talking. And by the autumn I felt brave enough to join the Tuesday night speed sessions. I started off entering races alone, a bit further from home and being supported by my little family, but as the year went on I got braver, I started wearing my SMM top to races and started to bump into other SMM along the way. The best 10k for medal alone has to be the Spitfire 10k at RAF Cosford (and I found a few bats at the start line too). I’ve entered again this year and really recommend it – know lots of other Bats are going. But my favourite 2 races are the last ones, not for the races but for the fact that I’m a member of our lovely club, and I had fun with people that support and challenge you to be your best. 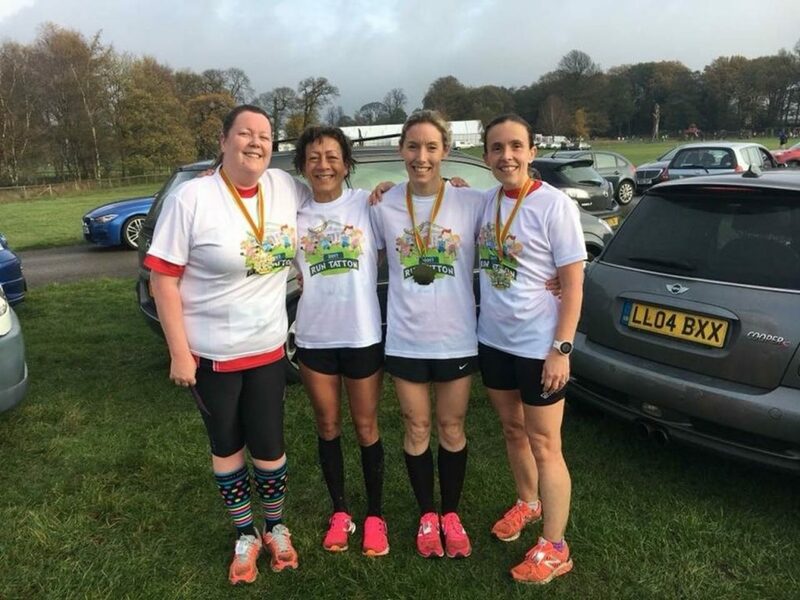 Tatton 10k: Some of the ‘fast’ runners extended an offer go to Tatton 10k with them and make a weekend away out of it, pretty sure I heard a whisper of Prosecco so I was in – and turning the corner to the final stretch to cheers from Ros, Pip and BGW, who had all had to hang around for quite a while for me, was lovely – and I’m pretty sure the fact that these ladies make it look so effortless was what inspired me to dig a bit deeper and get my current PB. Bizarrely our Chair seems to think I survived a weekend with them – but I’m pretty sure it was the other way round 😊. And for my very last 10k in 2017 several of the beginners group booked just to support me, and I was so grateful of the camaraderie at the start and the end – particularly as it snowed and was probably the coldest I have ever been. Not a PB for me but Dave offered great support on the way round and it was awesome to see Matt’s result in the 5k. I’ve learnt that I do actually like running, and that all the ‘real’ runners want to be better (even the ones that make it look easy!). However I’ll be honest and I really don’t understand the difference between running and racing – I’m still working on keeping my legs actually moving and breathing at the same time – so I’m happily still a beginner and I will be for some time to come – and that’s absolutely fine. While I’d love to be a racing snake (I’m naturally pretty competitive), I don’t think I’ll ever win a race – but I am beating me each time I get back out there and I’m very proud to belong to our club. So if anyone wants a challenge 10 10ks is actually achievable for anyone new to running and comes with a pretty awesome sense of achievement at the end. 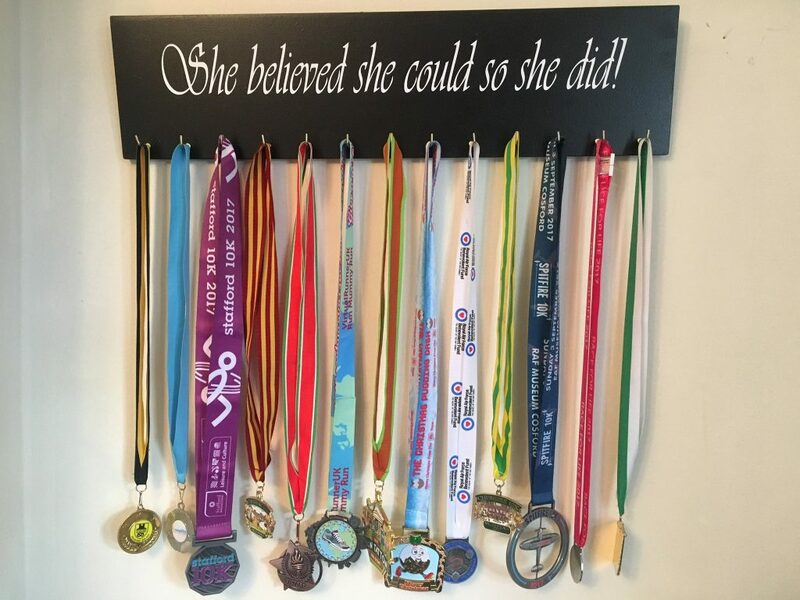 I’ve already been asked several times what my new challenge is, and the current answer is to do stuff that scares me (2 half marathons, Thunder run and a Hilly 5 mile) – not quite sure that’s enough yet – but it is only January….